It has been a month since my last post. What’s with that? Well, not to make any excuse but I’ve been busy working. Resting has been a priority on my days off. So what’s happened in the past month? 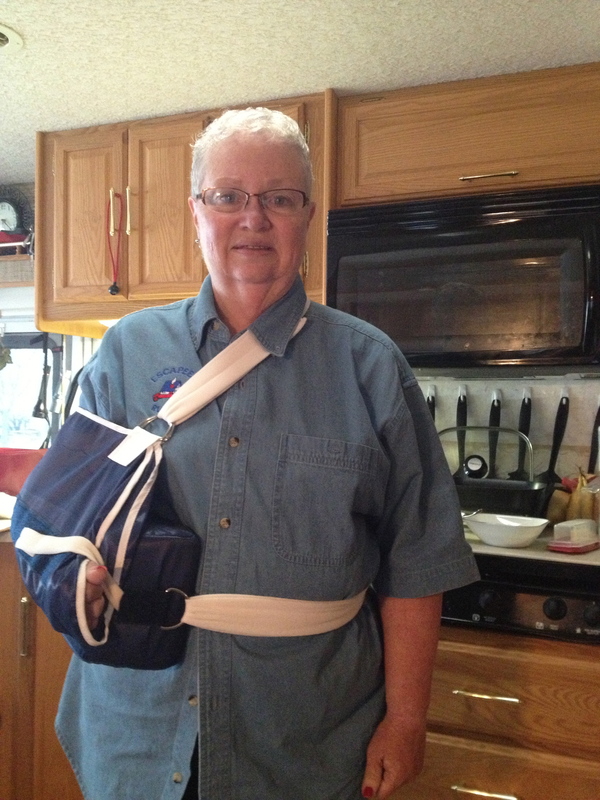 Carol had Rotator Cuff Surgery on her right shoulder April 16th. It was time to repair an old injury that needed repair before we get real busy around Mark Twain Landing RV Resort. She was out of work for two weeks. Now she is in PT twice weekly. The good news is she will get over this and will recuperate. The bad news is that her job duties have changed. Currently she is working the gate on the weekends. This gives her a few hours to add to my hours at the park. Once the park opens officially on Memorial Day weekend, she will be working in a float position at the swim park. I have worked on a few of big projects during the past month – repaired a hole in a rook of one of the rustic fishing cabins, replaced the sub floor in a bathroom and part of the floor in the kitchen. And replaced 40 feet of fencing that was blown down over the winter. Judging from the looks of the hole in the roof, a tree branch punctured the roof then as it fell off, it pried the roof upward thus creating a strange-looking hole. And of course it rained into the hole. Fortunately the rain was not heavy and the ceiling was 1/4 paneling not dry wall. The maintenance order indicated the commode was loose on the floor. Also the tile needed to be glued down. When I pulled up the loose tile, I discovered a very wet wood sub-floor. That was why the commode was not secure on the floor. After scrapping away the wet sub-floor, I realized I had to cut out about 9 square feet of flooring. After clearing the sub-floor, I discovered the wetness was also in the kitchen and the vanity drain line was never connected to the main drain. This project grew each day I work on it. I finally got the new sub-floor down and trimmed and laid new tile. Bathroom looks 100% better than it did. Remember the wet floor also went into the kitchen? Well, to repair that required removing a small water heater. Removal was no problem. Repairing the floor was no problem. Putting the water heater in, I managed to break the cold water main line feeding into kitchen. One more thing to fix. The good news is I did get it finished. The cleaning crew did not like that they had to go back and clean the cabin after they had already cleaned it. Forty feet of fencing adjacent to the wave pool blew down over the winter. The center photo was taken after the first day on this project. I had help on this one. That’s my work truck in the foreground. The right photo was the result of the morning work on day two. The afternoon of day 2, my work buddy George is trimming the top. The center photos shows the completed fence with a door opening. Tomorrow I finish the door and make sure all panels are secured. I thought I would include a photo of the wave pool This is day two of filling the wave pool which by the way is 8 feet deep. It takes 3-4 days to fill this pool. On a busy summer day, there can be between 500-800 people in the swim park enjoying the pools and slides. The water looked inviting today especially since it was pretty warm this afternoon. The ground water temperature here is a chilly 55 degrees. I think I’ll let nature warm the water a bit. Well, that’s a wrap for my work. Carol is still recuperating from her surgery and is completely bored with not much to do. We have found a great group of folks to work with and for at Mark Twain Landing. If you get near St. Louis or Hannibal, Missouri we would love to have you stop by for a visit. This entry was posted in Missouri and tagged Memorial Day, rv resort, swim park. Bookmark the permalink. Sounds like you have been really busy. I’m glad Carol is recovering well. I don’t know how long you guy are planning of being there. My son and his wife are moving to Springfield MO in July. They have a little girl now and are expecting twins the first of December. I will have to look and see how close we will be when we come to visit. We would love to see you guys! That’s some update! Carol, hope you continue to recover quickly and fully from surgery. Sounds like ya’ll are living the good, full life! Hugs! That is sure a lot of work you’ve done there. The place must be getting to look quite spiffy. I was starting to worry about what you guys were up to. Good to know Carol is recovering well! Love those projects that get bigger with every step! Enjoy the summer in Missouri! Give our regards to Carol. We hope she is back in the “swim” of things soon (since she has to “float”). My goodness, look at those projects you finished. You make everything look so nice and new. I bet they love having you there to fix everything.